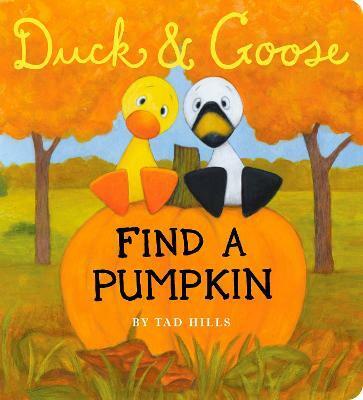 New York Times bestselling author and illustrator Tad Hills brings our favorite feathered friends out to find a big, beautiful pumpkin in this sturdy, large-sized board book. Duck & Goose look everywhere for a pumpkin--in the apple tree, in the leaf pile, inside a hollow log.... Where will they find one? The large size of this edition makes it a perfect book for sharing during storytime or lap time. TAD HILLS is the author and illustrator of the ALA Notable Book Duck & Goose--called "expressive and adorable" in a starred review from Kirkus Reviews--and Duck, Duck, Goose, both New York Times bestsellers. His Duck & Goose board books include the ALA Notable Book, What's Up Duck?, and the Indie bestseller, Duck & Goose: It's Time for Christmas! He is also the author-illustrator of How Rocket Learned to Read, a New York Times bestseller and a Parents' Choice Award Winner, and Rocket Writes a Story.